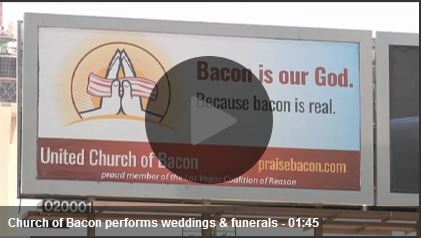 When the national FOX news runs a story about the United Church of Bacon, how will they spin it? They didn’t spin it, which was nice to find. They just reported the news, although they found a Rabbi who didn’t like us. “They’re mocking religion,” the Rabbi said, seeming a bit offended. Contained within that statement is the assumption that religion shouldn’t be mocked. Why not? Why give automatic deference to a set of beliefs that can’t be backed up with evidence? Well, at the United Church of Bacon we do like to mock religion, and we start with ourselves. See the Video that went out nationally, and the article on foxnews.com.